This Whole30 Chicken Thighs sheet pan dinner is an entire flavorful, healthy, and easy to make meal on one single sheet pan! 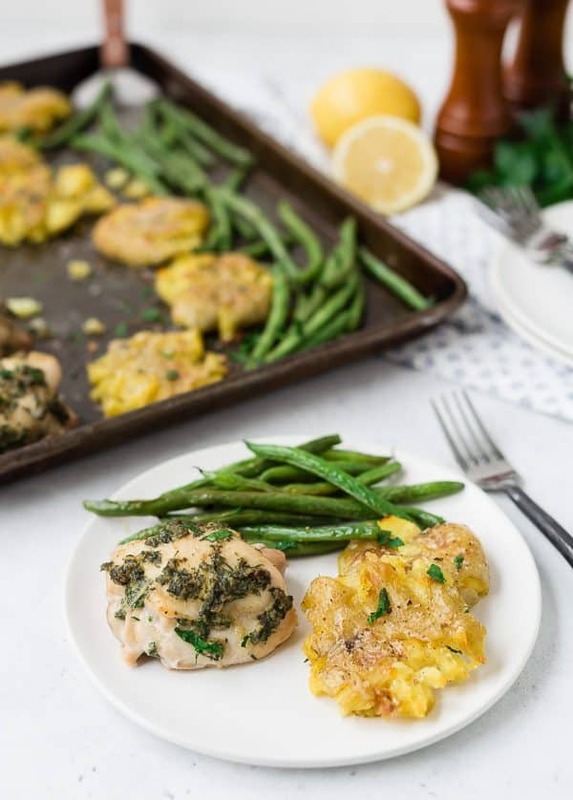 Whole30 or not, make it tonight! I’m so excited to share this recipe with you guys! 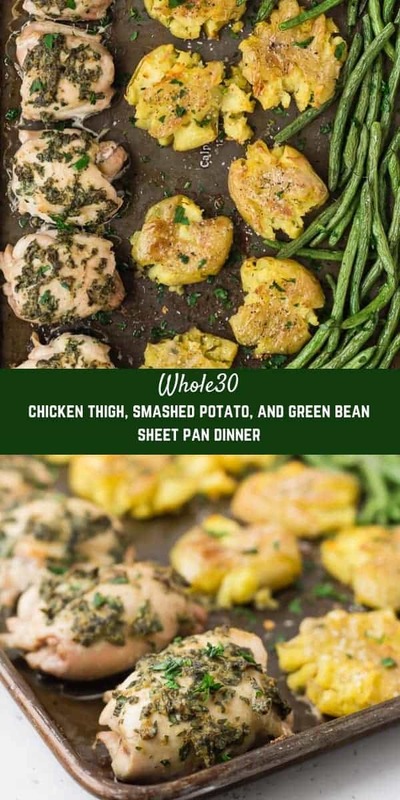 I didn’t intentionally set out to create this as a Whole30 compliant recipe, but as I was developing the flavors and ingredients, I realized…hey, this is Whole30 compliant! I know January is a big month for Whole30, so I decided to get it out to you guys ASAP! Regardless of if you’re doing a Whole30 or not (I’m not! 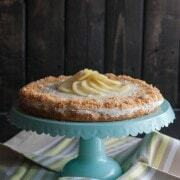 ), this recipe is a total winner. 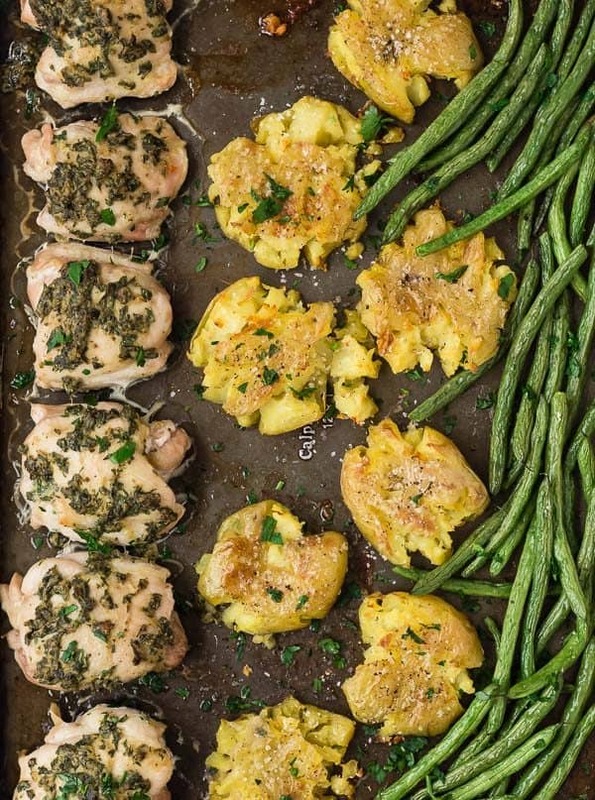 And….it’s all made on one pan. That’s what I do best, you know? Avoiding extra dishes at all costs. 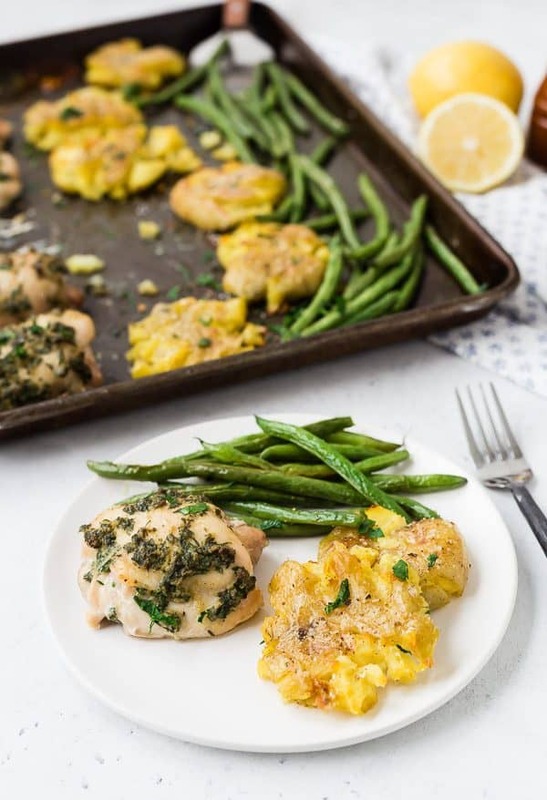 The evolution of this recipe began with chicken thighs with a little fresh chimichurri on the top, but as much as I love a good chimichurri, sometimes it can be bold and overpowering. It also can appear intimidating at first glance for people that maybe aren’t as comfortable in the kitchen (although, it really isn’t). I decided to take some of the flavors of a classic parsley and lemon chimichurri and make them into a little rub for the chicken. I added Dijon and garlic powder to kick the flavors up a notch, too. Putting the good stuff on as a rub and not as a sauce when it’s done cook allows the flavors to soak into the chicken as it cooks. 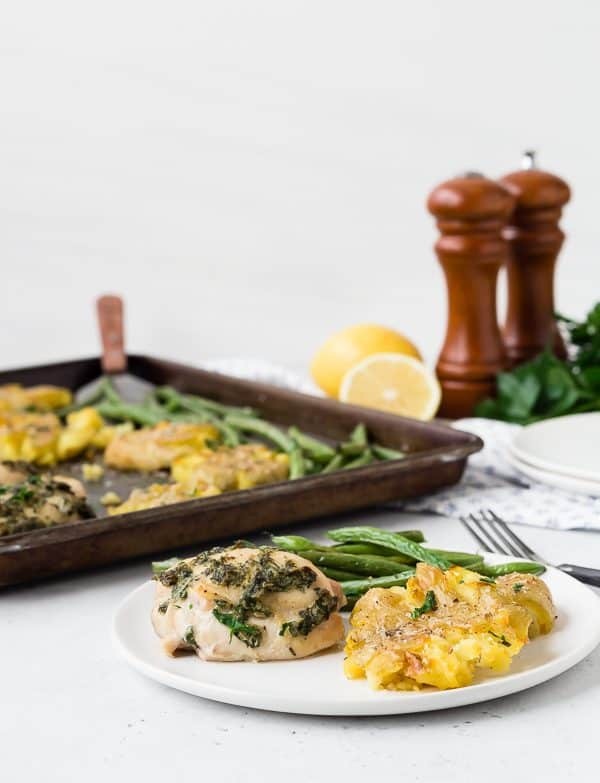 To brighten it up and add freshness at the end, I finish this recipe with a squeeze of fresh lemon juice and a sprinkle of fresh parsley. Tip: Love garlic? Ben doesn’t, so I often opt for garlic powder over fresh garlic, but 1-2 cloves of minced garlic would be great in this recipe in place of the garlic powder. Not that it’s uncommon for me to do this, but I was definitely eating this for lunch on the day I photographed it. I’m not sure it was even noon. Sometimes I even sit on the floor of my studio and eat, but I think I waited to start eating until I was back downstairs and had put the stuff I wasn’t going to eat into the fridge. I’m a bit of a crazy person about food safety, and by the time I finish photographing something, it’s about time for it to chill out in the fridge, you know? This is a great meal for the meat and potato lovers in the crowd. The smashed potatoes get perfectly crispy on the outside, but are soft and silky on the inside. 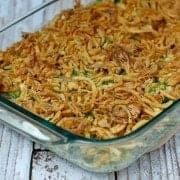 Based on the popularity of my Parmesan roasted green beans, I thought they’d be a great vegetable to round this out and make it a complete meal. You’ll see this in the recipe directions, but they get added part way through the cooking time. They don’t take long to cook at all and you don’t want to overcook them. 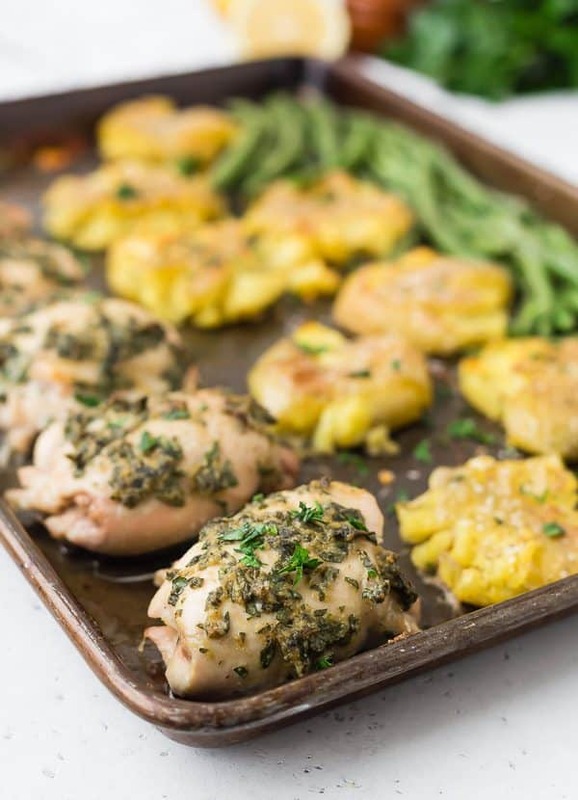 Tip: While the potatoes are cooking in the microwave, prep the parsley mixture/rub for the chicken and put the chicken on the sheet pan (don’t forget to also preheat your oven!). While the potatoes and chicken cook in the oven, you’ll have plenty of time to prep the green beans. I know the recipe looks long and complicated at first glance, but it really is quite simple and quick. Microwave potatoes in a microwave safe bowl, covered in water, for 8-10 minutes, or until fork tender but still firm (soft enough to smash/flatten). Let cool for 5 minutes and then carefully drain. Rub a little bit of olive oil on rimmed baking sheet and place potatoes onto oil. Carefully smash/flatten with a potato masher or a fork. 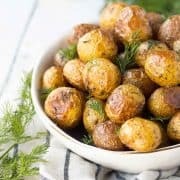 Rub potatoes with 1 tablespoon olive oil (a brush also works well for this), and sprinkle with salt and pepper. 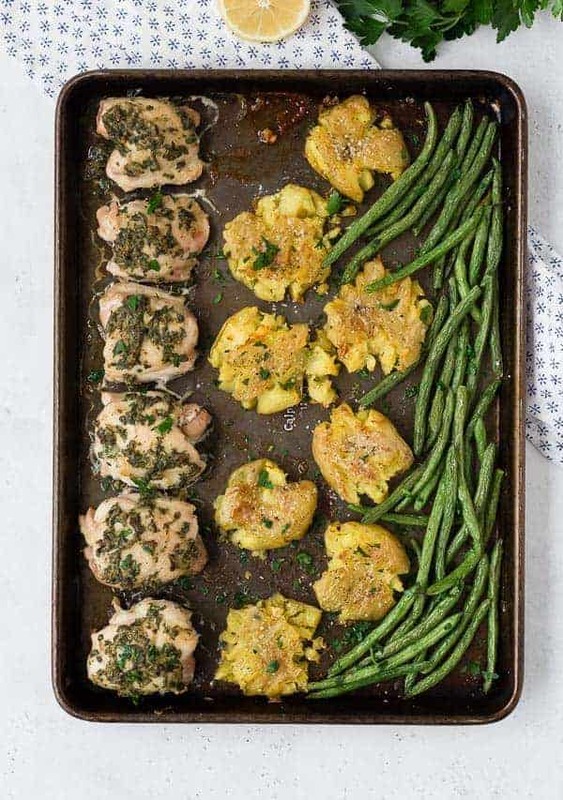 Place chicken next to potatoes. In a small bowl, mix together parsley, olive oil, mustard, lemon zest, garlic powder, salt and pepper. Rub this mixture onto each chicken thigh with a spoon or your hands. Bake for 15 minutes. Meanwhile, mix green beans with olive oil, salt and pepper. Remove pan from oven and add green beans in a single layer, if possible. Bake for an additional 10 minutes or until beans and potatoes are cooked and internal temperature of chicken reaches 165ºF. If desired, broil for 3-4 minutes on high to brown potatoes and make them extra crispy. Watch carefully to prevent burning! Squeeze with lemon juice (as much or as little as you like, alternately, you could serve it with lemon wedges). Serve immediately for best flavor and texture. 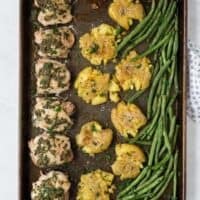 Make sure to choose a Whole30 compliant Dijon mustard if following the Whole30 plan. Many contain white wine and/or sugar, so read your labels. Verdict: This is most definitely going into regular rotation! Husband’s take: I have heard no complaints from Ben about this. This was DELICIOUS! Thanks for the suggestion, Rachel. Thank you! We loved this one!